My wife and I are currently in Italy, and I can’t express what it means to actually see some of the things I have been writing about. In one of my elementary science books, Science in the Scientific Revolution, I spend 8 lessons discussing Galileo Galilei, who lived from 1564 to 1642. He was the greatest natural philosopher (scientist) of his day, and he set the stage for Sir Isaac Newton, who would revolutionize the study of physics forever. While he aided our understanding of many aspect of Creation, he is best known for his contributions to astronomy. Based on a friend’s description of a Danish “spyglass,” Galileo made a telescope and used it in his study of the heavens. He discovered sunspots, the four largest moons of Jupiter, mountains and valleys on the moon, and most importantly, the phases of Venus. The moons of Jupiter as well as the phases of Venus supported the idea championed by Copernicus – that the earth orbited the sun, which sat at the center of the universe. As punishment, he was placed under house arrest for the remainder of his life. The point, of course, is that the judgement rendered by the Roman Catholic church made his family hesitant to bury him where the rest of his family was buried – The Basilica of Santa Croce. They were afraid it would anger prominent people in the church, so he was buried in the Novitiate Chapel that is connected to the basilica. 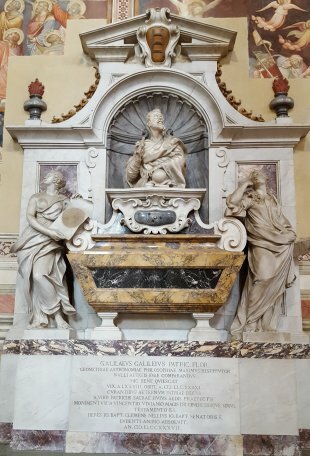 Nearly a hundred years later, however, his admirers were able to exert enough influence and spend enough money for the elaborate monument pictured at the beginning of this post, which is in a prominent place in the basilica. His body was exhumed and moved there in 1737. One very interesting aspect of the tomb is its location. It is directly across from the tomb of Michelangelo, who died within a few days of Galileo’s birth. Some say that spot was chosen because there was a popular belief that Michelangelo’s spirit left his body and went to Galileo. I don’t know if that’s true, but I can say that the location indicates that his admirers wanted to tell the world that Galileo was a treasured son of Florence, as was the famous artist. Another very interesting aspect to the tomb is that there are actually two bodies inside. One, of course, is the body of Galileo. The other is the body of his daughter, Sister Maria Celeste. When Galileo was exhumed, the body that was thought to be Galileo’s was actually that of a woman! Galileo’s body was found underneath the woman’s body. It turns out that his pupil, Vincenzo Viviani, had secretly buried his daughter there, apparently as a posthumous gift to him. As a result, both bodies now rest in the tomb. 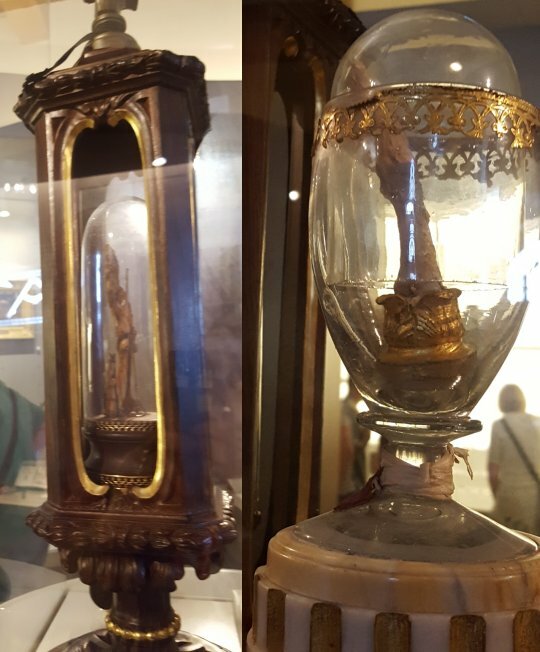 One final thing that I find interesting is that when Galileo’s body was moved, his admirers took three fingers, a tooth, and a vertebra as “keepsakes.” The vertebra is kept at the University of Padua, where Galileo taught for many years. The tooth and fingers are on display in the Galielo museum in Florence. I couldn’t get a good shot of them because of glare, but here are the two containers that hold the bones. The brown, wooden container holds two fingers and the tooth. The glass container holds the middle finger. While it might seem odd to you and me (my wife said, “disgusting”), bones of important people (usually saints) were commonly collected and often venerated. Once again, this is a symbol of how important Galileo was to many people. Thanks for the interesting commentary from your vacation! Thanks, Dr. Wile. I always enjoy your blog; the interesting science articles you comment on and the other things you write about. Have you read “Galileo’s Daughter” by Dava Sobel (I think I mispelled the author’s last name there.)? My son and I read it for homeschool this last year. It is based on the correspondance between Galileo and Sister Marie Celeste, telling Galileo’s story in the narrative the author writes around the letters. I cried when we got to the end and found out about Sister Marie Celeste being buried in her father’s tomb She was a faithful and loving daughter. Yes, I have read that book. I think it has the best treatment of his run-in with the Roman Catholic Church. I wrote a two-part review here and here. What are your thoughts on the veneration of relics, if I may ask? I don’t think it is something Christians should do. In my view, a dead body is an empty vessel. There is nothing to venerate. However, I have to admit that I was pretty excited to realize that I was staring at the bones that were once in the hands that did such clever experiments.